Chelsea Steverson (left), Lillian Castillo, and Monica Lopez as Weyward Sisters in the Utah Shakespearean Festival’s 2010 production of Macbeth. It’s Halloween once again. Here at the Utah Shakespeare Festival we love scary stories and are enjoying the spookiness of the season. Think about it: classic literature, including theatre, has brought about the scariest monsters in horror history; there’s just no better time for literature lovers than Halloween. So many great writers wrote horror, and I would say that the best horror writer of all time was Shakespeare! Were you expecting Bram Stoker? Dracula was pretty spooky. Or Frankenstein! Mary Shelley was the queen of scary stories! And Stephen King? Am I really saying that Shakespeare was better at horror than Stephen King? Yes, yes, and—well, maybe. I mean, Stephen King is scary. But Shakespeare was the Stephen King of his own day! There are so many spooks within his pages that you lose count. Some of the accounts of his monsters are positively bone-chilling. Why don’t we start with ghosts? After all, they’re pretty common, both in Halloween and in Shakespeare’s plays. Perhaps the most famous Shakespearean ghost is Old King Hamlet, come to seek revenge for his murder: “I am thy father’s spirit,/ Doom’d for a certain term to walk the night,/ And for the day confined to fast in fires,/ Till the foul crimes done in my days of nature/ Are burnt and purged away”(Hamlet 1.5.745–49). It’s the Ghost that causes all of the turmoil to begin in this complex play. In a story otherwise devoid of supernatural beings, the presence of a ghost here causes the confusion that will come to characterize the plot of Hamlet. The Ghost creates far more questions than he answers, throwing the audience into a feeling of mystery and terror. Popular legend holds that Shakespeare himself originally played the role of the Ghost. Around a century after Shakespeare’s death, Nicholas Rowe, another playwright, wrote that he had heard a story about the Bard playing the Ghost (Nicholas Rowe, editor, “Some Account of the Life &c. Of Mr. William Shakespear,” The Works of Mr. William Shakespear, ). And Shakespeare as a ghost certainly makes for a terrifying image. Hamlet’s ghost isn’t the only apparition in the canon. Another famous one is Banquo’s spirit, coming to haunt Macbeth and make him pay for his murderous deeds. Macbeth is scared witless by the presence of his departed adversary:“Avaunt! And quit my sight! Let the earth hide thee!/ Thy bones are marrowless, thy blood is cold;/ Thou hast no speculation in those eyes/ Which thou dost glare with!” (Macbeth 3.4.1388–91). There are even more ghosts in Shakespeare’s canon— Julius Caesar appears as a ghost, Richard III is visited by a veritable army of ghosts, Juliet reports seeing the spirit of her dead cousin Tybalt, and no less than three ghosts appear in Cymbeline. Why are there so many? Where did this fascination with ghosts come from? Though Elizabethan and Jacobean England was mostly Protestant, there were still traces of Catholicism. One belief of Catholicism was that souls who were sent to Purgatory ended up walking the earth until their sins were removed. Catholics believed in ghosts as people who were merely trying to get into heaven, very similar to the ghost in Hamlet. However, Banquo’s ghost and several others seem to act differently. The Protestants largely believed that ghosts were not the souls of men, but demons sent from Hell to torment people on earth (Thomas Browne, Religio Medici ). This seems to fit Banquo’s eerie ghost a lot better. Ghosts were an accepted part of life for most Elizabethan people. It’s no wonder, then, that Shakespeare created so many of them. There are other supernatural beings in Shakespeare, too. Some examples are sprites and monstrous creatures, like Ariel and Caliban in The Tempest, or the (make-believe) Herne the Hunter in The Merry Wives of Windsor. Puck in A Midsummer Night’s Dream is perhaps the most famous of these mischievous sprites. Although he is generally a benevolent creature, he plays cruel tricks and games upon the mortals of Athens, and references his own spookiness: “Now it is the time of night/ That the graves all gaping wide,/ Every one lets forth his sprite,/ In the church-way paths to glide” ( 5.1.2228–31). 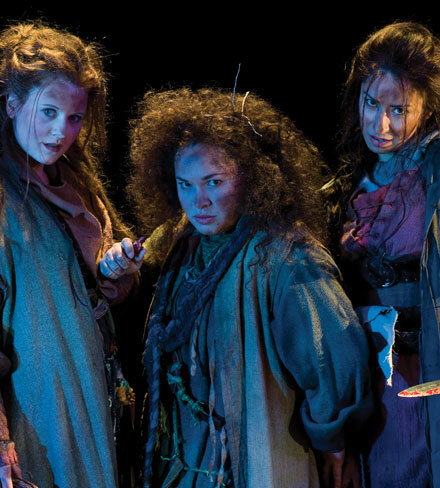 There’s no question, though, that the witches of Macbeth are the scariest spooks of Shakespeare’s canon. The specters make their first appearance in the opening lines of Macbeth. But it isn’t until Act IV that they get really chilling. Imagine it— three hags, ugly as can be (Banquo tells us earlier that they have choppy fingers, skinny lips, and beards) dancing around a bubbling cauldron in the dead of night, throwing in all sorts of macabre ingredients to enact their evil spell:“Double, double toil and trouble;/ Fire burn, and cauldron bubble . . . / By the pricking of my thumbs, / Something wicked this way comes” (Macbeth 4.1.1582–95). And then there’s one more witch in Macbeth that you may not have heard of. You know Hecate? That goddess from Greek mythology? Yeah, I didn’t think so. She appears as the queen of the witches in Macbeth— a figure so scary that even the Weird Sisters cower before her. Yikes! That’s a witch I wouldn’t want to see! Most scholars agree that Shakespeare didn’t write the Hecate scene; another Jacobean playwright, Thomas Middleton, probably added it to the play after Shakespeare’s death in 1616 (Amanda Mabillard, “Macbeth Glossary, Hecate Passage,” Shakespeare Online). Most directors just cut out Hecate’s scene entirely—so perhaps we shouldn’t count Hecate as a real Shakespearean spook. But why would someone add another witch to Macbeth? Doesn’t it have enough? Not according to King James, apparently. A popular theory is that he requested another witch. James Charles Stuart was king of both Scotland and England, after Elizabeth I had died. Shakespeare, always a shrewd businessman, tried to write plays that would appeal to the monarchy. After all, he’d written The Merry Wives of Windsor for Queen Elizabeth because she loved Falstaff so much (according to a popular anecdote). Shakespeare knew how to pander to his audience. So when the time came to write a play for King James, there was one topic that could spark his interest more than any other— witchcraft. James was infamous for his fascination with witchcraft. In 1597, the king wrote Daemonologie, a book dedicated to understanding witches and black magic. Shakespeare definitely read it; his description of the rituals in Macbeth matched James’s theories very closely (“King James IV and I’s Demonology, 1597,” The British Library [The British Library] 22 Sept. 2015). But it wasn’t only Daemonologie that proved James was obsessed with witchcraft. He conducted trials and hunted witches down, and even penned the Witchcraft Act of 1604— effectively making witchcraft a capital offense. So of course Shakespeare had to write a play about witches. A performance of Macbeth would definitely spark the king’s interests! Amazingly enough, the history of witchcraft and Macbeth doesn’t stop there. A lot of theatre folk believe the play itself was cursed by real witches living in England at the time. Perhaps Shakespeare used real incantations in his play, or perhaps a coven was offended at their rituals being used on the stage. Either way, there’s definitely something spooky about the play. Ask most actors, and they’ll tell you that they would rather do almost anything than say the word “Macbeth” in a theatre. The very name might bring a curse down on the place, causing all sorts of mayhem in the production! There are even rituals you can perform to negate the Macbeth curse— various versions include running around the theatre three times, spitting over your left shoulder, and uttering words of either profanity or quoting lines from Shakespeare’s luckier plays (A Midsummer Night’s Dream, perhaps). Shakespeare wasn’t kidding around about witchcraft! You could say that Shakespeare was a master of the supernatural genre. So this Halloween, instead of watching the new It movie or breaking out old copies of Psycho, dust off your copy of Hamlet or Macbeth and enjoy the spookiness that Shakespeare has to offer.